Home > News > News > It Only Takes 15 To Save! It Only Takes 15 To Save! Did you know it only takes 15 tickets to qualify for great group pricing at AMT? Our groups frequently consist of organizations, church groups, and social clubs. However, many of them are also groups of friends and family! Although it’s hard to think about Christmas when temperatures are soaring, wouldn’t it be nice to do something different this holiday season? If you plan now, you can have your gathering on everyone’s calendar early! 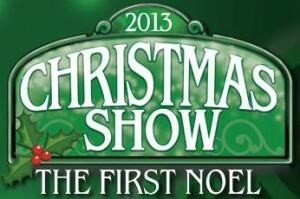 So, contact your friends, neighbors, and families and pick a date for The 2013 Christmas Show: The First Noel. – It’s a great way to celebrate the holidays together. – Enjoy a discounted ticket price. – Reserve your seats without a payment! Our group payment policies give you time to collect everyone’s money, but still reserve your seats. – Plus, if you get a group of 20 or more people, the group leader’s ticket is free! – Great package deals available! Call our group sales office at 1-800-648-4102 today with any questions or to reserve seats for this holiday tradition!